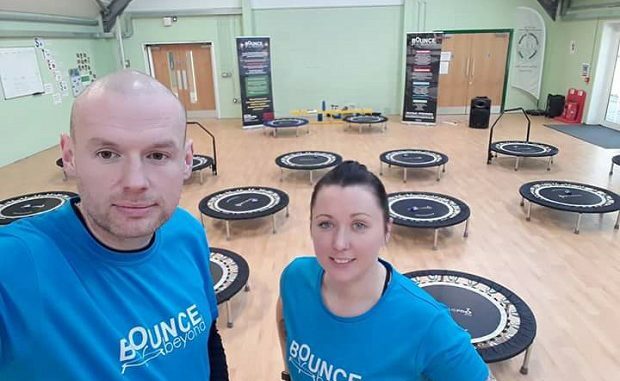 Bounce Beyond mini-trampoline workshops are being held in Margate next month to raise funds for charity. Broadstairs husband and wife team Ray and Karen Mitchell own Bounce Beyond and provide fitness classes on high quality mini-trampolines. They were prompted to hold a fundraiser for Guardian Angel Dog Rescue after rehoming a dog from the group last year. There will be four, 30 minute back to back classes with one bounce class, one Box Fit, one Bounce N Bells and one Abs attack with Kelly from The Gym Group. Small dumbbells or tins of beans/ bottles of water are needed for bounce n bells. Ray and Karen both have backgrounds in special educational needs enabling them to tailor workshops. Karen was a teaching assistant at Stone Bay School for over 10 years and Ray has been a head of PE and assistant head teacher as well as a former national high jumper and volleyball player. The sessions are on Saturday, February 2 from 1:30pm – 3:30pm at Trinity Community Resource Centre, St Mary’s Avenue, Margate, and cost £10.